New Cardiology Textbook 2018 dedicated a Chapter for the Enhanced External Counterpulsation treatment authored by Dr.S.Ramasamy, an International EECP expert. 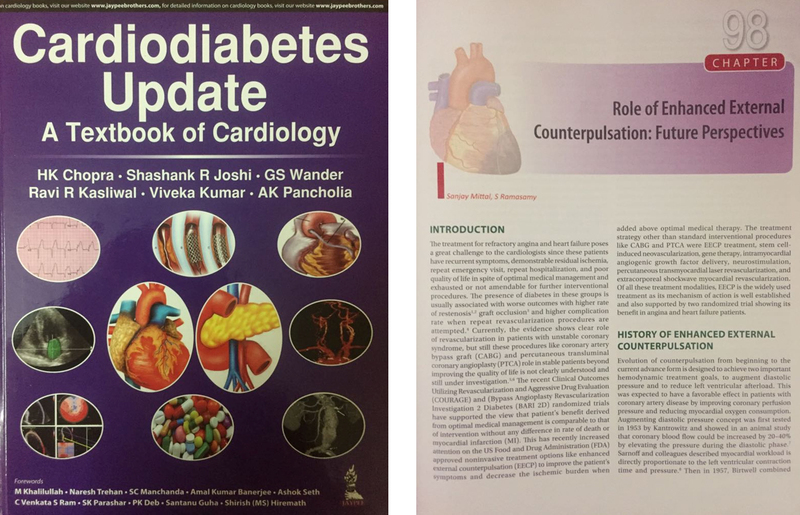 Enhanced External Counterpulsation treatment growth in India as a non invasive alternative for a selected group of patient with chronic stable angina and Heart failure is acknowledged by having a dedicated chapter allotted in “Cardiodiabetes Update A Textbook of Cardiology “ 2018 edition. The chapter “ Role of Enhanced External Counterpulsation: Future Perspectives” was authored by Dr.Sanjay Mittal, Director of Clinical Cardiology Medanta The Medicity, Haryana and Dr.S.Ramasamy International EECP expert and EECP consultant in Frontier Lifeline Hospital. The chapter covers in greater details, the History of Enhanced External counter pulsation, major randomised clinical trails, acute hemodynamic changes during EECP treatment, mechanism of action, Patient selection criteria, role of EECP in refractory angina and Heart failure. Enhanced External Counter pulsation (EECP) treatment is a non-invasive outpatient, day care treatment procedure for patients with refractory angina and heart failure. There are more than 250 EECP centres across India and more than 1000 centres internationally and growing. The requirement for educating the physicians and the clinical nurses who provide EECP treatment to patients is also rapidly increasing. In more than 250 centres across India only around 70-80 centres the therapist who providing the treatment are trained and certified. Dr.S.Ramasamy one of the pioneer in the EECP treatment internationally and the author of the EECP chapter commented , “Still a comprehensive clinical education program with practical training and certification for practicing cardiologists , physicians and therapist is lacking”. This gap in clinical advancement in EECP treatment and actual awareness about the treatment procedure will partly be addressed by this chapter in EECP treatment in standard cardiology textbook. However the need for a full certification course is still the need of the hour. Cardiology Text book with EECP chapter authored by Dr.S.Ramasamy along with Dr.Sanjay Mittal. If you need the copy of the EECP chapter text to the whatsapp no +919003078282 for more information on EECP.